Join us for a 10 day journey and an opportunity to access a side of India beyond the usual tourist trail. Come and experience the rich culture of Rajasthan, the stories that have shaped the landscape and the ancient artistic techniques which live to tell a tale of their own. Allow expert guides to lead you into a trip that’s like no other, weaving together arts, history, ancient practices, mythology, and modern culture in a way that is involved, vibrant and memorable. As part of your unique guided adventure enjoy rare access to exclusive full-day artisan workshops, such as block printing with the textile experts of Bagru and a day painting Indian miniatures with the royal artists of Jaipur City Palace. Alongside practical creative workshops you’ll spend your days discovering temples and palaces, classical yoga, heritage sites, cultural insights and authentic experiences. Take the time to wander through old city streets while listening to all the stories of local life, ride the railways, learn to cook from inside the kitchens of family homes, and then adventure into the desert with the camels and the stars to experience a night in a Rajasthani village. Get to know India from the perspective of the Indians; become inspired by a different way of living and discover your own potential as you go. And don’t worry, we won’t forget to check out the Taj Mahal and incredible Rajasthani palaces and forts too, while allowing enough time to rest at luxury accommodation throughout the trip. Tempted..? Let your curiosity lead the way. 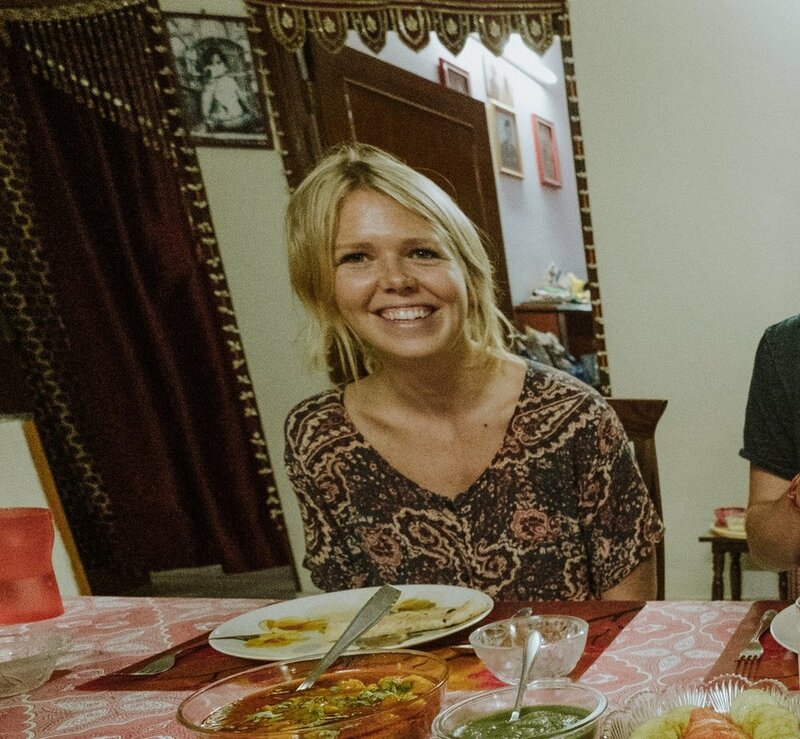 Victoria has spent years of her life exploring and living in India, creating relationships with local people and digging beneath the surface to access authentic experience. She has spent significant time studying Indian Miniature Painting at Jaipur City Palace which has created a deep love and extensive knowledge of Rajasthan, with insights into local culture. As your retreat host, Victoria speaks English and some Hindi, is a 1000hr certified Hatha and Ashtanga yoga teacher, and teaches art and yoga classes in Canada, UK and India. She is committed to offering a rich and memorable experience within a supportive group environment. Vivek lives in Jaipur and is a freelance tour guide licensed by the Government of Rajasthan. Vivek is of Rajput descent and is connected to some of India’s most influential teachers, thinkers and artists. As a family man and your local host he is experienced in offering cultural, heritage and artistic tours, all the while understanding the needs of western visitors and ensuring that the best service is provided. Vivek speaks Hindi and fluent English, is extremely knowledgeable and is full of local insights and tips. He also keeps us laughing all day long! Full day workshop in natural dyes and block printing with expert artisans of Bagru, India’s home of textile production. 8 nights accommodation in 5*, 4* and luxurious heritage hotels. Price is for a shared room with one other guest. To enjoy an optimum experience, spaces are limited on this tour (10 people max). Sign up early to avoid missing out! Use the form below to confirm your booking, or use the message field to ask any questions before committing. Thank you for your message regarding Inspired India 2019! We will be in touch shortly. A reservation requires a deposit of 30% of the total price at the time of booking. The rest of the payment is due at least 60 days before travel. Final price will be adjusted to include 5% GST. Prices are in Canadian Dollars. If paying in a different currency the international exchange rate on day of payment will be applied. Please wait for registration confirmation before booking your flights. If coming by airplane, please book your flight to arrive at Indira Gandhi International Airport, Delhi (DEL) and take a government taxi to our Delhi hotel. We will meet as a group in Delhi on September 21st and will say goodbye on September 30th at the same hotel. You are welcome to extend your personal trip to spend more time in the country. Please ask if you need any assistance in organizing travel. Use the form above to sign up and reserve your space!